Learn about the blue whale, a creature that’s so big its tongue weighs about the same as an elephant. The blue whale, so named because of its blue-gray coloration, is a marine mammal and a baleen whale. Reaching lengths of up to 29.9 meters (98 feet), and possibly over 181 tons (200 short tons), it’s known as the largest creature to have ever existed on earth. There are three distinct subspecies of the blue whale that are recognized today: Balaenoptera musculus musculus (North Atlantic and North Pacific), Balaenoptera musculus intermedia (Southern Ocean) and Balaenoptera musculus brevicauda (Indian Ocean). Balaenoptera musculus brevicauda is also known as the pygmy blue whale. The blue whale has a long, slender build with a flat, U-shaped head and relatively tiny dorsal fin. Though this whale is so large, it’s does not attack with its teeth or prey on other large sea creatures as one would expect. In fact, the blue whale doesn’t even have teeth! Being a baleen whale, it feeds almost exclusively on small crustaceans known as krill. This whale was hunted almost to extinction in the early twentieth century but quick intervention and collaboration in the international community has seen its numbers gradually recovering. Though, for now it’s still listed as Endangered by the IUCN. About 70 to 100 years. Blue whales can grow up to 29.9 meters (98 feet). The maximum recorded weight for an individual blue whale was 173 tons (191 short tons) and possibly over 181 tons (200 short tons). Typically, they swim at kilometres per hour (12 mph) when traveling. But they can reach speeds of 50 kilometres per hour (31 mph) for short periods of time. They slow down to a speed of 5 kilometres per hour (3.1 mph) when feeding. Blue whales tend to move alone, as a result, they don’t form the large groups seen in other baleen whales. From evidence gathered over the years, the blue whale is more at risk from human beings than the other way around. Though the hunting of blue whales is now illegal, this creature is not entirely safe from human activities yet. It’s frequently wounded, many times fatally, after colliding with ocean-going vessels. It could also get entangled in fishing gear. Another worrisome problem is the issue of ocean noise, especially sonar from vessels. Sonar can drown the sounds made by whales thereby making it difficult for them to communicate with one another. Apart from human beings, the natural predator of the blue whale is the orca (killer whale). Though, there’s no conclusive evidence that orca attacks on this whale ends in its death. 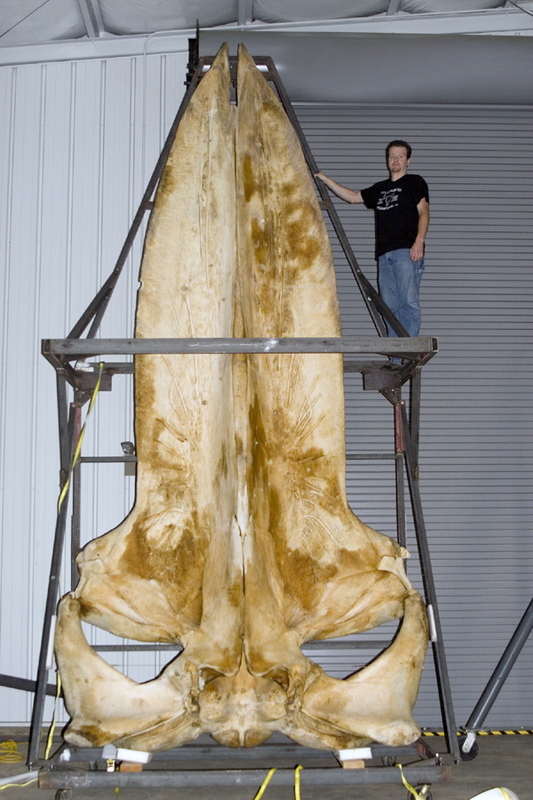 19 Foot Blue Whale Skull, Smithsonian Museum of Natural History (Author: Sklmsta/Wikimedia Commons cc.0 1.0). Blue whales are not dangerous to human beings. Mating among the blue whale species starts in late autumn till the end of winter and it is often characterized by fierce competition among the males to get the attention of the females. Gestation period is for 10 to 12 months after which the calves are born at the beginning of winter. Newborn blue whale calves weigh approximately 2.5 tons (2.8 short tons) and are around 7 meters (23 feet) long but they double in length and weight within a period of just six months because of the fat content of their mother milk. Young blue whales reach sexual maturity at five to ten years old. Blue whale milk has a calorie count of a whopping 18,300 kJ/kg (4,370 kcal/kg) and calves will drink almost 100 to 150 U.S. gallons (380 to 570 liters) of milk every day. The blue whale is a filter feeder. When it hunts for food, it will dive into the water and swim towards large schools of krill, or other small prey with its mouth wide open. By doing that, it will gulp large amounts of water along with the prey. In the place of teeth, they have overlapping baleen plates hanging down from both sides of their upper jaw. These plates are arranged to give a comb-like appearance with gaps between them. The whale then shuts its mouth and forces excess water out through the baleen plates leaving only its prey behind in its mouth. 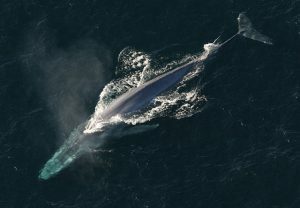 Adult blue whale can conveniently consume up to 40 million krill in a day to build up a rich energy reserve for mating season. Blue whales were previously abundant in nearly all the oceans on Earth till commercial whalers hunted them almost to extinction from the early to the mid-twentieth century. Whalers from European countries (e.g. Norway and Iceland), and Japan devised tools specifically for capturing and killing very large whale species, and they were too successful at it. The blue whale was hunted to extinction along the entire Japanese coast in the early twentieth century. Luckily, an international intervention in 1966 by the International Whaling Commission helped protect the blue whale. Unfortunately, by that time the damage was already severe. For instance, where there used to be almost 300,000 blue whales swimming in the Antarctic region, by the 1970s, their numbers had reduced to just over 300 individuals. Recent figures show a slow but steady increase in blue whale numbers globally but the numbers are nowhere near what the original populations were. IUCN estimates put the present population at anywhere between 10,000 and 25,000. It is listed as Endangered on the IUCN Red List. The blue whale belongs to the rorqual whale group. They are the largest among baleen whales but they have a more streamlined rather than stocky build. This group includes the fin whale, minke whale, the humpback whale, Bryde’s whale, and the sei whale. Research indicates that this group of whales separated from other families sometime during the Oligocene Epoch, about 28 million years ago. Also, from DNA sequencing, scientists were able to establish that the blue whale is closer to the sei whale and Bryde’s whale than to other members of the group. There are also sightings of blue whale-fin whale hybrids and humpback-blue whale hybrids in the wild. The blue whale still lives in many of the oceans worldwide though the most abundant concentration is about 2,800 individuals in the eastern North Pacific Ocean. In this location, they range from Alaska to Costa Rica, then California (mostly in the summer). Occasionally, individuals are spotted in the northwest Pacific between Kamchatka and towards the northern tip of Japan. Other locations you can find them include: the North Atlantic (Greenland, Nova Scotia, and Newfoundland), the Northern Indian Ocean, and Antarctic waters. They prefer to swim at depths of about 13 meters (42.5 feet) when migrating apparently to avoid drag from surface waves. Typically, the blue whale is a solitary animal or at most you’ll see them moving in twos. The few times they come together in large groups, it’s commonly where there is a large concentration of prey.